Myelosuppression: DROXIA may cause severe myelosuppression. Monitor blood counts at baseline and throughout treatment. Interrupt treatment and reduce dose as necessary [see Warnings and Precautions (5.1)]. Malignancies: Hydroxyurea is carcinogenic. Advise sun protection and monitor patients for malignancies [see Warnings and Precautions (5.2)]. These highlights do not include all the information needed to use DROXIA safely and effectively. See full prescribing information for DROXIA. 15 mg/kg/day as a single dose once daily based on the patient’s actual or ideal weight, whichever is less. Monitor the patient’s blood count every 2 weeks [see Warnings and Precautions (5.1)]. *Maximal dose is the highest dose that does not produce toxic blood counts over 24 consecutive weeks. Increase dosing only if blood counts are in an acceptable range. Do not increase if myelosuppression occurs. If blood counts are considered toxic, discontinue DROXIA until hematologic recovery. Reduce the dose from the dose associated with hematologic toxicity. May titrate up or down every 12 weeks in 2.5 mg/kg/day increments. The patient should be at a stable dose with no hematologic toxicity for 24 weeks. Discontinue the treatment permanently if a patient develops hematologic toxicity twice. 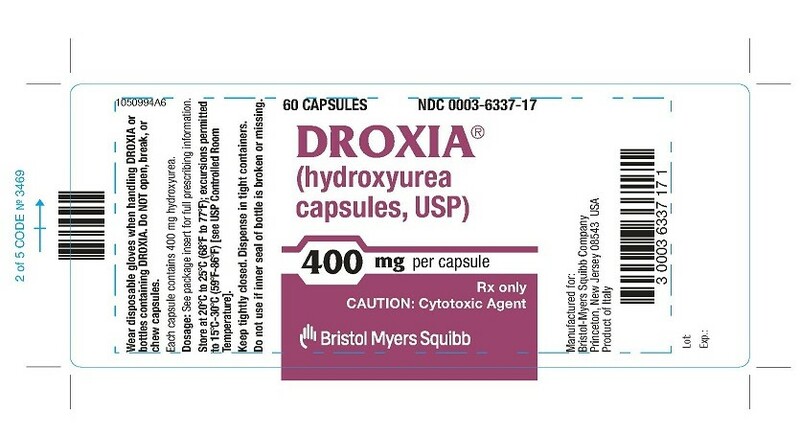 Patients should swallow DROXIA capsules whole and not to open, since hydroxurea is a cytotoxic drug. Patients must be able to follow directions regarding drug administration and their monitoring and care. Fetal hemoglobin (HbF) levels may be used to evaluate the efficacy of DROXIA in clinical use. Obtain HbF levels every three to four months. Monitor for an increase in HbF of at least two-fold over the baseline value. 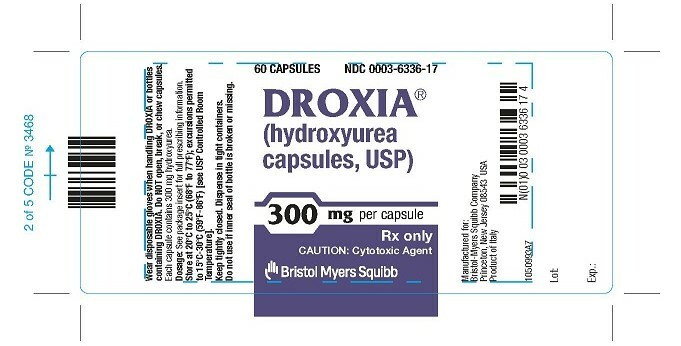 DROXIA is a cytotoxic drug. Follow applicable special handling and disposal procedures [see References (15)]. Reduce the dose of DROXIA by 50% in patients with creatinine clearance of less than 60 mL/min or with end-stage renal disease (ESRD) [see Use in Specific Populations (8.6) and Clinical Pharmacology (12.3)]. Creatinine clearance values were obtained using 24-hour urine collections. Based on the mechanism of action and findings in animals, DROXIA can cause fetal harm when administered to a pregnant woman. Hydroxyurea was embryotoxic and teratogenic in rats and rabbits at doses 0.8 times and 0.3 times, respectively, the maximum recommended human daily dose on a mg/m2 basis. Advise pregnant women of the potential risk to a fetus [see Use in Specific Populations (8.1)]. Advise females of reproductive potential to use effective contraception during and after treatment with DROXIA for at least 6 months after therapy. Advise males of reproductive potential to use effective contraception during and after treatment with DROXIA for at least 1 year after therapy [see Use in Specific Populations (8.1, 8.3)]. The following adverse reactions have been identified during post-approval use of hydroxyurea in the treatment of neoplastic diseases. Because these reactions are reported voluntarily from a population of uncertain size, it is not always possible to reliably estimate their frequency. Hypersensitivity: Drug-induced fever (pyrexia) (>39°C, >102°F) requiring hospitalization has been reported concurrently with gastrointestinal, pulmonary, musculoskeletal, hepatobiliary, dermatological or cardiovascular manifestations. Onset typically occurred within 6 weeks of initiation and resolved upon discontinuation of hydroxyurea. Upon re-administration fever re-occurred typically within 24 hours. DROXIA can cause fetal harm based on findings from animal studies and the drug’s mechanism of action [see Clinical Pharmacology (12.1)]. There are no data with DROXIA use in pregnant women to inform a drug-associated risk. In animal reproduction studies, administration of hydroxyurea to pregnant rats and rabbits during organogenesis produced embryotoxic and teratogenic effects at doses 0.8 times and 0.3 times, respectively, the maximum recommended human daily dose on a mg/m2 basis (see Data). Advise women of the potential risk to a fetus and to avoid becoming pregnant while being treated with DROXIA. Elderly patients may be more sensitive to the effects of hydroxyurea, and may require a lower dose regimen. Hydroxyurea is excreted by the kidney, and the risk of adverse reactions to this drug may be greater in patients with impaired renal function. Because elderly patients are more likely to have decreased renal function, care should be taken in dose selection, and it may be useful to monitor renal function [see Dosage and Administration (2.2)]. Conventional long-term studies to evaluate the carcinogenic potential of DROXIA have not been performed. However, intraperitoneal administration of 125 to 250 mg/kg hydroxyurea (about 0.6-1.2 times the maximum recommended human oral daily dose on a mg/m2 basis) thrice weekly for 6 months to female rats increased the incidence of mammary tumors in rats surviving to 18 months compared to control. Hydroxyurea is mutagenic in vitro to bacteria, fungi, protozoa, and mammalian cells. Hydroxyurea is clastogenic in vitro (hamster cells, human lymphoblasts) and in vivo (SCE assay in rodents, mouse micronucleus assay). Hydroxyurea causes the transformation of rodent embryo cells to a tumorigenic phenotype. 200 mg opaque blue-green capsules, marked in black ink with “DROXIA” and “6335” (NDC 0003-6335-17). 300 mg opaque purple capsules, marked in black ink with “DROXIA” and “6336” (NDC 0003-6336-17). 400 mg opaque reddish-orange capsules, marked in black ink with “DROXIA” and “6337” (NDC 0003-6337-17). There is a risk of myelosuppression. Monitoring blood counts every two weeks throughout the duration of therapy should be emphasized to patients taking DROXIA [see Warnings and Precautions (5.1)]. Advise patients to report signs and symptoms of infection or bleeding immediately. Advise patients that there is a risk of cutaneous vasculitic toxicities and secondary malignancies including leukemia and skin cancers. Advise use of sun protection [see Warnings and Precautions (5.2, 5.4)]. Advise patients to inform their healthcare provider if they have received or are planning to receive vaccinations while taking DROXIA as this may result in a severe infection [see Warnings and Precautions (5.5)]. Advise females of reproductive potential of the potential risk to a fetus and to inform their healthcare provider of a known or suspected pregnancy. Advise females and males of reproductive potential to use contraception during and after treatment with DROXIA [see Warnings and Precautions (5.3) and Use in Specific Populations (8.1, 8.3)]. Advise females to discontinue breastfeeding during treatment with DROXIA [see Use in Specific Populations (8.2)]. Patients with HIV infection should contact their physician for signs and symptoms of pancreatitis, hepatic events, and peripheral neuropathy [see Warnings and Precautions (5.6)]. DROXIA can harm your unborn baby. You should talk with your healthcare provider about the risks of DROXIA to your unborn baby. You should use effective birth control during treatment with DROXIA and for at least 6 months after treatment. Your healthcare provider will perform a pregnancy test before you start treatment with DROXIA. You should avoid becoming pregnant during treatment with DROXIA. Tell your healthcare provider right away if you become pregnant or think you may be pregnant. DROXIA can affect your sperm. If you have a female sexual partner who can become pregnant, you should use a condom during treatment with DROXIA and for at least 1 year after treatment. DROXIA may cause fertility problems in males. Talk to your healthcare provider if this is a concern for you. See What are the possible side effects of DROXIA? for more information about side effects. have kidney problems or are receiving hemodialysis. have human immunodeficiency virus (HIV). Taking DROXIA with certain HIV medicines can cause serious reactions and may lead to death. Tell your healthcare provider if you take an HIV medicine. have increased level of uric acid in your blood (hyperuricemia). have a history of receiving interferon therapy or are currently receiving interferon therapy. plan to receive any vaccinations. You should not receive live vaccines during treatment with DROXIA. are pregnant or plan to become pregnant. See What is the most important information I should know about DROXIA? are breastfeeding or plan to breastfeed. DROXIA can pass into your breast milk. Do not breastfeed during treatment with DROXIA. How should I take DROXIA? Take DROXIA exactly as your healthcare provider tells you. DROXIA is taken 1 time a day. - Wear disposable gloves when handling DROXIA capsules or bottles containing DROXIA. - Wash your hands with soap and water before and after handling DROXIA capsules or bottles containing DROXIA. - Swallow DROXIA capsules whole. Do not open the capsules. - Avoid contact with crushed or opened capsules. If contact from crushed or opened capsules happens on the skin, wash the skin area right away and thoroughly with soap and water. If contact from crushed or opened capsules happens in the eyes, flush the eyes thoroughly with water or isotonic eyewash used for that purpose for at least 15 minutes. - If the powder from the capsule is spilled, wipe it up right away with a damp disposable towel. Throw the damp disposable towel and the empty capsules away in a closed container, such as a plastic bag. The spill areas should then be cleaned three times using a detergent solution followed by clean water. See What is the most important information I should know about DROXIA? Skin ulcers and death of tissue (gangrene) have happened in people who take DROXIA. This has happened most often in people who receive interferon therapy or have a history of interferon therapy. Your healthcare provider will stop treatment with DROXIA if you develop any skin ulcers. Enlarged red blood cells (macrocytosis). Macrocytosis is common in people who take DROXIA and can make it difficult to detect a decrease of folic acid. Your healthcare provider may prescribe a folic acid supplement for you. These are not all the possible side effects of DROXIA. Store DROXIA at room temperature between 68°F to 77°F (20°C to 25°C). Keep the DROXIA bottle tightly closed. 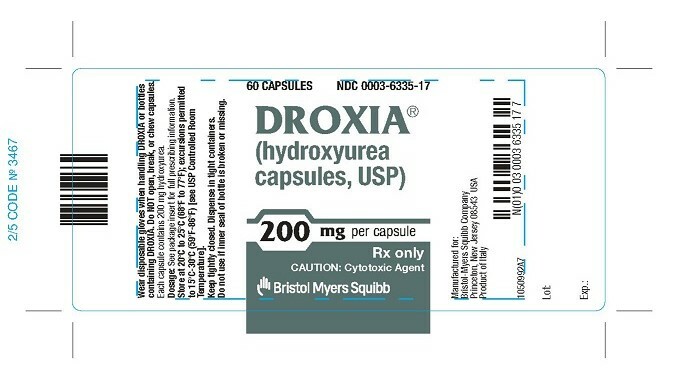 Call your healthcare provider for instructions on how to throw away (dispose of) DROXIA that is out of date. Keep DROXIA and all medicines out of the reach of children. Keep DROXIA away from pets. Medicines are sometimes prescribed for purposes other than those listed in a Medication Guide. Do not use DROXIA for a condition for which it was not prescribed. Do not give DROXIA to other people, even if they have the same symptoms you have. It may harm them. You can ask your healthcare provider or pharmacist for information about DROXIA that is written for health professionals. Inactive ingredients: citric acid, gelatin, lactose, magnesium stearate, sodium phosphate, titanium dioxide, and capsule colorants: FD&C Blue No. 1 and FD&C Green No. 3 (200 mg capsules); D&C Red No. 28, D&C Red No. 33, and FD&C Blue No. 1 (300 mg capsules); D&C Red No. 28, D&C Red No. 33, and D&C Yellow No. 10 (400 mg capsules). For more information, go to www.BMS.com or call 1-800-721-5072. See How Supplied section for a complete list of available packages of DROXIA.